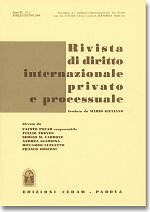 The third issue of 2013 of the Rivista di diritto internazionale privato e processuale (RDIPP, published by CEDAM) was just released. It features four articles and two comments. Sergio Maria Carbone, Professor Emeritus at the University of Genoa, provides an assessment of party autonomy in substantive and private international law in “Autonomia privata nel diritto sostanziale e nel diritto internazionale privato: diverse tecniche e un’unica funzione” (Party Autonomy in Substantive and Private International Law: Different Techniques and a Single Function; in Italian). The paper focuses on the techniques through which party autonomy may operate in contractual relationships with the aim of assessing that (i) such techniques are, in practice, more and more difficult to define as to their respective fields of application; (ii) irrespective of which of such different techniques is actually deployed, they all share the common objective and the unified task to accomplish, in the most exhaustive way, the plan that the parties intended to implement by executing their contract. Indeed, party autonomy may operate either as a tool for the regulation of an entire relationship or of parts thereof, or as a conflict of laws rule or, again, as a direct or indirect source of regulation of contractual relationships. Whatever the specific role played by party autonomy with regard to a given contract, party autonomy eventually pursues the aim of executing the parties’ underlying programme, provided that the fulfillment thereof is consistent with public policy, overriding mandatory rules and with the mandatory rules of the State with which the contract is exclusively connected. In this view, it is also confirmed the gradual establishment of the so-called material considerations method with regard to private international law solutions and, in particular, to the choice of the national legal system which may come into play in determining the law applicable to contractual relationships. Cristina Campiglio, Professor at the University of Pavia, examines the history of private international law from the Statutaries to the present day in “Corsi e ricorsi nel diritto internazionale privato: dagli Statutari ai giorni nostri” (History Repeating Itself in Private International Law: From the Statutaries to the Present Day; in Italian). Private international law (“PIL”) aims at pursuing its basic mission, i.e. coordinating the different legal systems and underlying legal cultures, by providing an array of practical solutions. However, no rigid recipe proves to be completely satisfying. As a matter of fact, a growing evidence is accumulating that a merely dogmatic approach is often inconclusive and that PIL implementation cannot be reduced to a mere sum of rigid techniques. Rather, it has turned into an art of its sort, where theories and legal sensibilities may be compounded time to time in different ways. Due to the difficulty (the impossibility, at times) to define a clear-cut hierarchy of values – whether arising from the national legal systems or inherent to individual rights – the legal operator has to come to terms with juridical relativism and, in the absence of any binding guidance, search the most suitable solution to the case in point. Concerning the family law field, which has been known to be the most affected by normocultural differences (i.e., differences in law which are a reflection of cultural differences), it appears that the preferred solution should be the one that assures the continuity of individual status both in time and in space. In the past few years, this need of continuity has led scholars to revaluate old legal theories and to develop a new method (the so-called recognition method), which essentially put aside conflict rules. This method has been used occasionally by the domestic legislator, who has developed a number of “receptive” choice-of-law rules. However, the recognition method is hard to be applied when the foreign legal institution is unknown to the local court and an adaptive transposition is required. In such an event, another aged theory can be resurrected, i.e. the substitutive method. The main goal of this contribution is on the one hand to provide evidence of the persisting relevance of the old legal theories mentioned above (some of which dating back to the seventeenth century), while suggesting on the other hand the need to give methodological rigor up, in favor of a more eclectic and efficient exploitation of the variety of methods that PIL makes available. Carla Gulotta, Associate Professor at the University of Milano-Bicocca, addresses jurisdiction over employers domiciled abroad namely with reference to the Mahmadia case in “L’estensione della giurisdizione nei confronti dei datori di lavoro domiciliati all’estero: il caso Mahamdia e il nuovo regime del regolamento Bruxelles I-bis” (The Extension of Jurisdiction over Employers Domiciled Abroad: The Mahamdia Case and the New Regime under the Brussels Ia Regulation; in Italian). After years of doctrinal debate, public consultations and normative efforts, the Recast of the Brussels I Regulation was finally adopted on 12 December 2012. Among the most innovative features of the new Regulation is the extension of the jurisdiction of EU Member States’ courts towards employers not domiciled in the Union. According to the author the new rules cannot be labeled as giving raise to “exorbitant grounds of jurisdiction”, nor can they be entirely understood unless they are read as the outcome of the efforts of the EU’s Legislator and judges to guarantee the enforcement of European rules aimed at employees’ protection in international employment cases. The article also argues that while waiting for the new Regulation to become effective, the European Court of Justice is anticipating its effects through an unprecedented wide construction of the expression “branch, agency or establishment” ex Art. 18(2) of Regulation No 44/2001. Lastly, the author suggests that the difficulties envisaged as for the recognition and the enforceability of the judgments given on the new grounds of jurisdiction might be overcome in respect of those Countries knowing similarly extensive rules of protective jurisdiction, or otherwise recurring to a principle of comity. Rosario Espinosa Calabuig, Profesora Titular at the University of Valencia, examines the interface between the 1999 Geneva Convention on the Arrest of Ships and Regulations Brussels I and Brussels Ia in “¿La desarmonización de la armonización europea? A propósito del Convenio de Ginebra de 12 de marzo de 1999 sobre embargo preventivo de buques y su relación con los reglamentos Bruselas I y Bruselas I bis” (The Disharmonization of the European Harmonization? Remarks on the Geneva Convention of 12 March 1999 on the Arrest of Ships and Its Interface with Regulations Brussels I and Brussels Ia; in Spanish). The International Convention on Arrest of Ships of 1999 came into force on September 14, 2011, and so far it has been ratified by only four EU Member States, including Spain. As the precedent Convention of 1952 – which is still in force in most of the EU Member States – the 1999 Convention prescribes rules on both international jurisdiction, and recognition and enforcement of decisions. Accordingly, the European Union seems to be the one entity having standing to ratify the 1999 Convention, at least with regard to those rules. To this effect, doubts arise about the legality of the aforementioned accession of EU Member States to the Convention but, in particular, about the EU interest in the ratification of the Convention of 1999. Such ratification ought to be encouraged by other Member States, but this is not granted at all. Still, the EU might authorize Member States to ratify the 1999 Convention as previously occurred with reference to other maritime Conventions, such as the 2001 Bunkers or the 1996 HNS. Meanwhile, the 1999 Convention is already operating in countries like Spain. Hence, conflicts arising from the non-coordination between its provisions and those of the Brussels I Regulation ought to be addressed. Among such conflicts are, for example, those arising from a provisional measure being adopted inaudita parte by different courts within the European area of justice. Furthermore, the Brussels I Regulation was recast by Regulation No 1215/2012 which will be in force as of 2015, and among other innovations abolishes exequatur. This paper aims at unfolding those conflicts which might be solved by resorting to the ECJ case-law, in particular Tatry and TNT Express. Lidia Sandrini, Researcher at the University of Milan, “Risarcimento del danno da sinistri stradali: è già tempo di riforma per il regolamento Roma II?” (Compensation for Traffic Accidents: Has the Time Come to Amend the Rome II Regulation? ; in Italian). This article addresses Regulation EC No 864/2007 in so far as it deals with traffic accidents, at the aim of investigating whether there is an actual need for amendments to the rules applicable in this field. It is submitted that the coordination between the Regulation and the Motor Insurance Directives can be achieved through the interpretation of the different legal texts in the light of their respective scopes and objects. On the contrary, the impact of the application of the Hague Convention of 4 May 1971 on the Law Applicable to Traffic Accidents definitely needs to be addressed by the EU legislator, in order to ensure the consistency of the solutions in the European judicial area. Finally, with regard to the interpretation of specific connecting factors provided for by the Regulation, it appears that most of the difficulties highlighted by Scholars and faced by judges are due, on one hand, to an inaccurate drafting, and, on the other hand, to the lack of explicit and detailed solutions with regard to general problems, such as the treatment of foreign law, the law applicable to the preliminary questions, and characterization. Luigi Pintaldi, Law Graduate, “Il contrasto tra lodi arbitrali e decisioni dei giudici degli Stati dell’UE nel regolamento (CE) n. 44/2001 e nuove prospettive” (The Conflict between Arbitral Awards and EU Courts Decisions under Regulation No 44/2001 and New Perspectives; in Italian). This article addresses the exclusion of arbitration from the scope of Regulation EC No 44/2001, as interpreted by the Court of Justice of the European Union in the well-known case West Tankers. In West Tankers the Court maintained that the validity or the existence of an arbitration agreement determined as an incidental question comes within the scope of the Brussels Regulation when the subject-matter of the dispute comes within the scope of it. This unsatisfactory result raised the issue of recognition and enforcement of a judgment from a Member State in conflict with an arbitral award recognised and enforced in another Member State. The recognition and enforcement of a judgment may be refused in conformity with paragraphs 3 and 4 of Article 34 affirming that the arbitral award is treated like a judgment with res judicata effects. Alternatively, the recognition and enforcement of a judgment may be refused in accordance with the paragraph 1 of Article 34 stating that the New York Convention prevails over the Brussels I Regulation. Recently, the precedence of the New York Convention was explicitly provided by paragraph 2 of Article 73 and Recital 12 of the new Brussels I Regulation, i.e., Regulation EU No 1215/2012. The exclusion of arbitration was retained by the new Brussels I Regulation with further details: in fact, the ruling rendered by a Court of a Member State as to the validity or the existence of an arbitration agreement now falls within the scope of application of the Regulation, regardless of whether the Court decided on this as a principal issue or as an incidental question. In the light of the new Brussels regime, it seems clearer that the question whether a judgment from a Member State shall be recognized and enforced when it is in conflict with an arbitral award is left to each national law and international conventions. Indexes and archives of RDIPP since its establishment (1965) are available on the website of the Rivista di diritto internazionale privato e processuale.